The good folks in Umbria must have had a couple of good Sagrantino harvests. I keep winding up with bottles of Montefalco Rosso, an Italian red made from that expensive to produce grape, blended with some other varietals. These wines make good options for your Labor Day grilling. While the harvests have been strong, Umbria also has some pretty serious issues of its own at the moment. 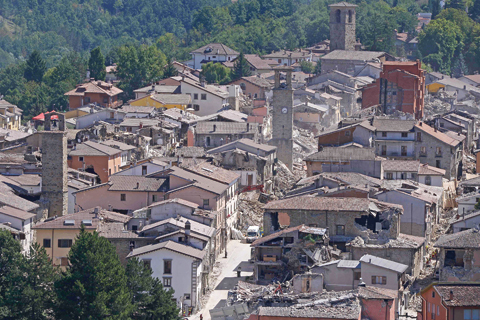 Many of you have probably read about the 6.2 magnitude earthquake in Italy that leveled hundreds of structures. The casualty numbers continue to climb. The epicenter of that earthquake was in Umbria, and many of these wines are produced scant kilometers from cities which stood from Medieval times until last week. Obviously, we’re limited in what we can do to help directly – although purchasing Umbrian wine is one indirect help. If you would like to make a contribution, you can donate directly to the Italian Red Cross or to the National Italian American Foundation – both of which are currently working on relief efforts. To refresh your memory, the Sagrantino grape has been grown in Umbria at least as far back as the mid 1500’s, with some scant records indicating it may have been grown as early as the turn of the millennium. This grape, grown primarily for sacramental and religious festival wines, was almost wiped out until the early 1990’s, when growers were able to gain a classified status for the grape and expanded the production. On its own, Sagrantino creates enormous, tannic reds which have the highest concentration of polyphenols like resveratrol which are the compounds that give red wine its health-related benefits. It’s also the most tooth-staining varietal that I’ve ever happened across, just as a warning. In many regions, heavily tannic grapes are often blended with lighter varietals -- and the juice can be from either red or white grapes – to balance tannin and acidity in big wines or to create wines that are more approachable to the general public. In neighboring Tuscany, the winemakers there blended their native Sangiovese grapes with merlot, cabernet, and other red wines to create the now-ubiquitous Supertuscans. Borrowing from that model, the Umbrians created Montefalco Rosso, a lighter-styled red wine which features Sagrantino in the blend. Since Sagrantino itself makes for big, honkin’ wine – a little of it goes a long way in the blend. Also, grapes like Sagrantino tend to be fairly expensive to produce. Most Sagrantino Montefalco start at around $40 and go up front there. Winemakers like to turn a profit, and blending can help them produce quantities of wine at a lower price point to help with the bottom line. Here are a few of those Montefalco Rosso, which you can find for around $20-25. Arnaldo Caprai 2012 Montefalco Rosso – Once this one got some air (which involved me pouring the wine through an aerator into a decanter, then funneling it back into the bottle after an hour), the Caprai opened right up into a very interesting, bold red. The tannins were considerably softer than many wines made with Sagrantino, and there wasn’t nearly as much heat and roughness as I’d run into previously. The nose is full of currants with a backdrop of menthol. The body is full and rich with red fruits and some firm but not overwhelming tannin. The finish is long with just a little bit of an alcoholic bite to finish. It’s a bold red for any occasion with which you’d like a bold red. Go with grilled meats, nuts, and stinky cheeses. Scacciadiavoli 2012 Montefalco Rosso – We found this one to be a little more bold than the Caprai. If you like your Italian wines a little on the rustic side, this would be a solid choice. Lots of depth of fruit at first taste up in the plum/blueberry range. That’s accompanied by some slightly rough tannins that remain so even after considerable air. They’re not overbearing, but you know you’ve got a wine with oomph. Finish is long, fruity, and dry. We had this with an eggplant parmesan – both out of the oven and a couple of days later with leftovers. Good pairing which would do well with roasts, big sauces, and such. 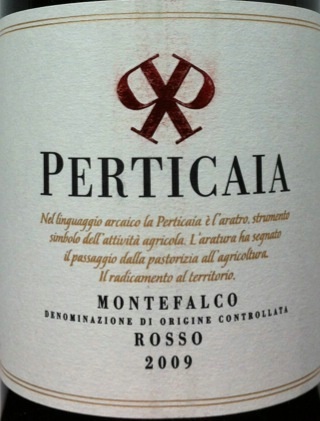 Perticaia 2013 Montefalco Rosso – By far the most mellow of the three, and the most pleasant just to drink. The tannins are smoother than in either of the other two, and it’s a little more fruit-forward. Nose is plums again, with a little bit of an herbal tinge. The body’s full, although not as “clingy” as the others. The fruit and tannins are both dark and relatively well balanced. The finish doesn’t have the length that the other two do, largely expected with the lighter tannins. I thought it worked well against a marinara-laced penne dish.